Looking for an insider's view on things to do? We've tapped our in-the-know staff for their picks on L.A.'s best events and experiences. Enjoy! April brings longer days and ideal weather for outdoor fun in La La Land. We’ve rounded up an assortment of events for our epicureans, tree huggers, and even travelers with canine companions. On April 7, head to the Rose Bowl for a taste of some of LA’s finest bars, restaurants, and dessert shops at Masters of Taste luxury food festival. For an early Earth Day celebration, head to Grand Park in Downtown LA on April 11 for green living demos (including electric vehicles) and activities (yoga boot camp). If you want to make a sustainable mark on LA, join the Friends of the Los Angeles River’s annual cleanup. The effort will tackle different parts of the river on April 13, 20, and 27. Work hard, but play hard too: the event will include live music performances, gift giveaways, family activities, and refreshments. We can’t forget our guests with furry friends in tow. PAWSAPALOOZA Festival & Marketplace will celebrate all things canine on April 20 in West Hollywood. Grab that leash and enjoy pet-friendly products, a costume contest, food trucks, drinks, and treats galore. Travelers spin through their Rolodex of film memory and begin to check off the sights and landmarks from their favorite movies and T.V. shows. 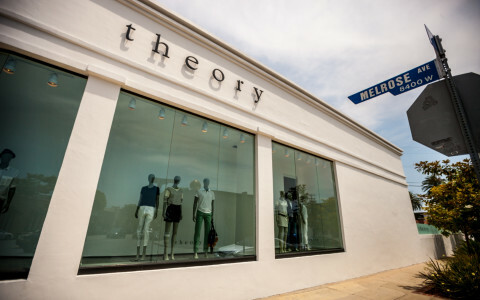 Melrose Avenue is among the most popular West Hollywood destinations, in part, because of the hit 90’s soap opera Melrose Place, now a modern cult classic. Fans will be surprised, however, when they visit Melrose Avenue to find a bustling network of conceptual clothing shops, designers, film studios, urban hangouts, and eateries instead of the quiet residential block represented in the show. Perhaps the most unique “surprise” found on Melrose is the Melrose Trading Post, an open-air market for hard-to-find vintage collectibles and eclectic handmade wares from vendors all over the city. The Trading Post is open every Sunday, rain or shine, and asks a $5 admission to benefit the Greenway Arts Alliance, a nonprofit organization whose mission is to reconnect the city through art. Be sure to stop by the market when you take your Melrose Avenue stroll. Regarded as one of Los Angeles’s most-visited locations, this iconic landmark has a storied past, draped in glamour, talent, and the love of the fans avidly awaiting the rise of their favorite celebrity’s star. 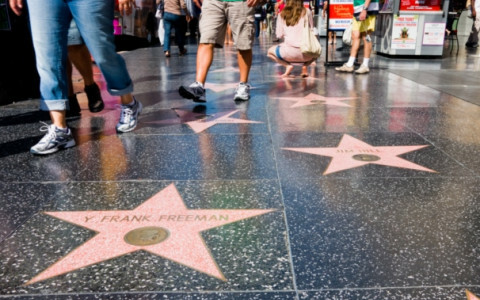 What you don’t know about the Hollywood Walk of Fame will thrill and surprise you as you plan your stroll down the Walk which lies only a few blocks from our hotel. When the original idea for the Hollywood Walk of Fame was pitched, it was meant to include caricature drawings of the celebrity. The problem was, the planners and real estate developer, the famed Mr. Hollywood, had already settled on a color scheme for Hollywood Blouvard which would have clashed with the drawings. The Walk originated at the corner of Hollywood Boulevard and Highland in 1958 and hasn’t changed much in the last several decades, but the surrounding city is in a constant state of reinvention. To commemorate the Walk’s anniversary and our dynamic city, in 2010 the Hollywood Chamber of Commerce, accompanied by Bob Barker, placed a large time capsule beneath the inaugural star featuring items they felt reflected L.A. as it existed then. The capsule is scheduled to be opened in 2060. If you’re a repeat visitor to our city, then you’ll know the sense of déjà vu first-timers sometimes feel when strolling the Walk. Yes, it’s possible you did pass Frank Sinatra’s star two or three times. You may have also seen multiple stars for Bing Crosby, Dean Martin, and Bob Hope. There are many celebrities that own more than one star due to nominations in various categories. There’s also a possibility that the star you’re gazing at doesn’t belong to who you think. Consider this when searching for the star of Michael Jackson or Harrison Ford—you wouldn’t want to confuse the King of Pop and the lovable intergalactic rogue with the radio host and silent film star of the forties. Los Angeles is the perfect setting for trendy fashions, eclectic art, and local specialty items that can rarely be found anywhere else. Hit the streets only a short distance from our hotel to West Third Street, one of our city’s top walkable shopping districts and get the most of your shopping experience. 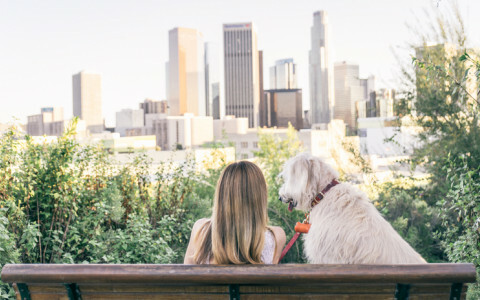 If you are on the hunt for hidden treasures, you’re sure to find them as you stroll through over one hundred shops, eateries, and bars that dominate these six blocks of quintessential L.A. flair. Third Street’s proximity to fascinating L.A. staples like the original Farmer’s Market and the L.A. County Museum of Art make it a prime spot to spend the day, the night, or anything in between. Once you’re done shopping on West Third Street, stop by The Grove, L.A.’s top entertainment complex for glamorous events, blockbuster movies, and the best in Instagram-ready photo opportunities. Take advantage of the gorgeous weather on your West Hollywood vacation this season and head out onto the streets for any one of the city’s festive holiday parades. There are plenty to thrill and entertain every traveler, but we’ve gathered our favorites for you here. Make your way to the marina on December 8, 2018, for the 56th Annual Boat Parade, a free event showcasing the finest in nautical decoration and holiday spirit. The parade kicks off at 6 p.m., but be sure to stay for the firework show over the water at the end of the night. Founded in 1890, this globally famous parade is now in its 131st year and still going strong. Originally organized to celebrate the beauty of California, the parade has become a worldwide staple in recognizing the New Year as it’s traditionally held on New Year’s Day every year. Featuring hundreds of thousands of flowers, dancers, musicians, and equestrian riders, this historic parade is not to be missed. West Hollywood boasts mild weather in the month of November which makes it the perfect time to explore the mysterious, yet treasured, historical site, La Brea Tar Pits & Museum. Though a famous attraction, a deluge of misconceptions surround the pits. Most visitors tend to think that we’ve learned all there is to know from the tar pits. Not true. This site is highly active. Paleontologists continue to excavate the pits and glean new insights into history, medicine, and even space travel every day! Contrary to popular belief, the only fossils found in the tar pits date 11,000 to 50,000 years ago which is just about sixty-five million years after dinosaurs were already extinct. However, a variety of bird species have been found encased in the tar—the dino’s closest living relative. Popular film and internet would have you believe the tar pits were once the dumping grounds of famous gangsters, renegades, and warring settlers. The opposite is true. No human remains have been discovered since 1914, and that was the ritual funeral burial of a 9,000-year-old girl called La Brea Woman. She was lovingly put to rest with her giant dire wolf. Whether you're visiting West Hollywood for work or play, we want your visit to our hotel to be as special to you as it is to us. We scared up this year's best events near Le Parc Suites to show the best our city has to offer this Halloween season. Show your environmental side at this totally solar powered, waste-free music festival only a quick ride down Sunset Blouvlard. Bring your reusable containers and festival gear so you can dance, eat, and drink the night away with a lineup of more than ten local bands. All proceeds benefit Grid Alternatives GLA and construction on new solar power rooftops. This historic graveyard is the resting place for thousands of yesteryear’s Hollywood elite. In that fashion, Hollywood Forever has partnered with Cinespia to bring your their Halloween film series from October 13th-31st. Bring a blanket, a lawn chair, cooler and picnic beside the mausoleum of the starlets. There will be a prescreening DJ before and after the feature presentation. Whenever a new museum opens in Los Angeles, it’s reason for celebration. The Broad has been gaining recognition since opening its doors in 2015, and the magnificent installations by Yayoi Kusama have been causing quite a stir. Spend the day getting acquainted with the stars. Kusama’s Infinity Mirrored Room immerses viewers into a sparkling pulsating starfield of LED lights. The experience only lasts 45-seconds but the memory will last a lifetime and so will the Instagram-worthy shots. Make your way to the first-floor installation the second you arrive because the wait time can go into the hours. Her newest installation Longing for Eternity is also on view and visitors can peer through a small opening into a LED light-filled chamber for a visual transportation into a complete immersion of boundless transcendence. Kusama was born and raised in Japan and emerged as an artist during the Vietnam era. Her works reach a diverse international audience and her body of work spans over six decades. Have you experienced our recently remodeled Skydeck yet? We are so excited to welcome you to our new rooftop paradise. Start your day with a luxurious dip in our inviting pool with the sun just peeking over the horizon. Let go of your worries and socialize with your friends on our poolside loungers shaded by golden umbrellas that pop like fireworks against the crystal blue sky. A lunch of mojitos and farm-to-fabulous gourmet dishes are to follow. Vitamin D is provided by the sun, but all other nurturing comes from us. Spend the day under the glow of the Los Angeles rays and in the best company. 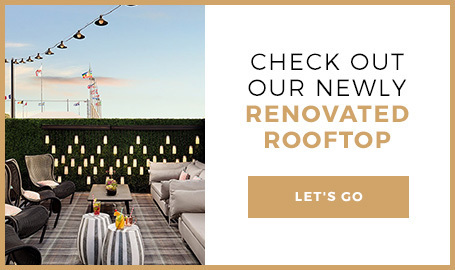 So slip into something more comfortable and meet us on the roof. Are you ready to jump in? Vacations in Los Angeles are for relaxation and fun. That's why we suggest heading over to Santa Monica for a chill day on the Santa Monica Pier. Start by looking out across the horizon and taking in the breathtaking Pacific Ocean views. A solar-powered Ferris wheel, roller coaster, and a dozen rides await you. Visit this iconic West Coast spot that has been featured in a myriad of movies such as Quicksand, Forest Gump, Iron Man, A Night at the Roxbury and more. Enjoy the variety of all ages activities with locals and visitors. Our favorite is the Santa Monica Pier Aquarium which houses 100 species of local fish and is run by the nonprofit Heal the Bay. Stay until evening to hear live local bands play. Select from an array of restaurants and pubs that have cold beers and craft cocktails to help you cool off and keep you refreshed. Take a leisurely stroll along the shoreline with the bright moon glistening on the waves or come back during the daytime to enjoy the three-mile stretch of white sand beaches at the State Beach. Beautiful city views and excellent films are returning for the fourth consecutive year. Rooftop Cinema Club is an elevated outdoor movie experience located at NeueHouse Hollywood and LEVEL. Watch movies al fresco such as Coming to America, Ghostbusters, and Romeo + Juliet with the stars overhead. Your ticket includes freshly made unlimited popcorn as well as charming lawn chairs and blankets upon request. Shared double deckchairs are a little more expensive but picture-perfect for a romantic date. Catch every line of your favorite flick, with wireless headphones provided by the venue. Los Angeles is the backdrop to a vast array of Hollywood movies-- it only fits to get lost in the cinematic-splendor of a captivating film. Over 30 plus films are being shown, and the series runs until the end of June. For tickets, please click here. Treat the crew to a day of food, music, and inspiration. Le Parc Suite is centrally located, making a day trip to Santa Monica a breeze. Hosted in the Barker Hangar, EEEEEATSCON is returning for the second year. Foodies will rejoice, as the festival is bringing local and cross-country restaurants, award-winning chefs, and talented musicians for one day only, May 19th, 2018. Imagine a festival where the restaurants are the headliners, and a sample means a full-sized portion. Too good to be true? We agree, but in the words of The Infatuation, “EEEEEATSCONis as much about connecting with a community and getting inspired as it is about eating and being entertained.” Snag scrumptious dumplings from Lunasia Dim Sum House located in San Gabriel Valley, or relish in a slice of pristine pizza from Roberta’s Brooklyn. For tickets and a full lineup, click here. Where else can you visit The Museum of Selfies, catch a rooftop movie, and sleep amongst the stars? It’s no secret that Los Angeles is jammed-packed with fun activities. However, we think springtime is the best time. The combination of the pleasant weather, clear skies, and if you are planning on visiting Disney, shorter lines, makes for a winning situation. To be honest, there are shorter lines for basically all of the tourist attractions and it’s easier to snag coveted restaurant reservations and more. We suggest kicking off your vacation with a night at the Troubadour, located just a stone's throw away from our luxe hotel. Rolling Stones named it “one of the best rock clubs” and we can’t help but agree. Other top activities here include hitting the beach, taking a surf lesson, going hiking, and visiting a museum. Le Parc Suite has always been a hidden favorite for stars and celebrities, but that doesn’t mean you can’t be in on the secret. Celebrate your spring break in the heart of West Hollywood; reserve your room now for guaranteed springtime feels. Feel the luck of the Irish by heading to the center of the festivities. With over 100 kegs of green beer, traditional foods, games, and DJ’s, it’s sure to be a massive celebration. Pop in and see Chelsey Johnson discussing her debut book, Stray City, with Carrie Brownstein of Portlandia and Sleater Kinney. A funny and thoughtful book about nuclear families and the choices we make. Spend an evening swaying to the off-beat soul influenced setlist from this local Los Angeles band. Their new album is out March 30th. Don’t miss this chance to hear some local tunes. Spend Valentine’s Day in one of the most romantic cities in the world--we can’t wait to welcome you at Le Parc Suite Hotel because nothing says “I love you” like breakfast in bed, a bottle of Prosecco, and chocolate covered strawberries delivered to your room. Book an amorous getaway right in the heart of Los Angeles. Start the day snuggling bedside with a full American breakfast that will have you feeling splendid. Relish in the lazy morning before venturing to our stunning Sky Deck for a refreshing rooftop pool dip. Melt into oblivion on lush lounge chairs while spending quality time together and enjoying the view. Finish the night with an intimate dinner at Knoll that will nourish your body and soul. The food is expertly crafted by our Executive Chef and features locally sourced farm-to-table goodies you're going to love. Call in advance to secure your spot, (310) 855-8888. Our accommodations are tailored to provide you with the most comfortable and decadent vacation yet! We look forward to celebrating your love. Annually, we challenge ourselves to create a list of resolutions to jet start the year. Let us help you succeed with three suggestions that will make your Los Angeles vacation the best one yet. Get Fit: Head upstairs to our Skydeck for a day of heart-pumping fun activities. Start with a round of tennis on our private court, followed by a refreshing dip in the heated pool. Reenergize on our luxurious lounge chairs before heading indoors for an optional sweat session in our full-service gym. Treat yourself to a relaxing wind-down in the sauna and let the worries of yesteryear melt away. Eat Healthier: Kick off your health regime with a scrumptious meal at our on property eatery, Knoll. Indulge in the farm-to-table menu that changes seasonally to nurture your body and soul. Experience More Art: We are huge fans of contemporary art. From the Rauschenberg prints at Knoll to the artwork adorning the hotel, we simply can’t get enough. But if you feel like exploring, head to Los Angeles County Museum of Art, The Broad, Museum of Contemporary Art, or the Hammer Museum. Your day is guaranteed to be spent admiring the finest local and international artists in the world. Le Parc Suite Hotel is your secret oasis, follow these three resolutions for an amazing vacation. Get into the festive mood while visiting our steadfast city. This Christmas enjoy a picturesque backdrop of swaying palm trees, rolling hills, and waves crashing on the shore. LA may not be the first place that pops into your mind when you hear “Christmas,” however, we know how to celebrate. Start with a fun twirl around the ice skating rink at Pershing Square, formerly known as Downtown on Ice. It’s the first Los Angeles outdoor rink and due to new technology, the ice stays frozen, even in 80-degree weather. If you missed the Hollywood Christmas Parade--then head to Disneyland for nightly parades, or visit the Grinch at Universal Studios Hollywood for a night to remember. It’s perfect for you and your loved ones. But if you are feeling sophisticated, book a ticket to see The Nutcracker Ballet at the Broad Stage at Santa Monica Performing Arts Center for a magical evening. Pass by the concierge on your way out and let us plan your perfect evening. Christmas isn’t until December 25th, but we celebrate all month long. Have you ever wondered how Los Angeles got its name? Keep reading and we’ll let you in on a little secret. Los Angeles is a sprawling metropolis with hidden corners and surprises. Here are three interesting facts about Los Angeles you might not know. Los Angeles Is HUGE - If it were its own country, it’s economy would be bigger than Sweden, Switzerland, and Saudi Arabia. The Film Industry Wasn’t Always in LA - The film industry transitioned from East Orange, NJ in 1907, and moved to sunny Los Angeles because of the weather, the diverse terrain, and the distance from Thomas Edison and his Motion Picture Patents. Enjoy your new found knowledge while exploring West Hollywood! West Hollywood Carnaval is the world’s largest and most unique celebration of it’s kind. Taking place on the spookiest night of the year, it’s the optimal party to tap into your Halloween spirit. Each year there is an estimated half a million people in attendance, including film, theater, and reality TV stars. There are also six stages for live musical performances, drag queen shows, stand-up comedy, art and celebrity appearances, and more. In Los Angeles, you never know which celebrity is going to show up. Past years have included performances by Boy George and a Rocky Horror Picture Show tribute featuring Tim Curry. Commemorate the creepy holiday by putting on your most ghoulish and fantastical costumes and heading to the one-mile-stretch of Santa Monica Boulevard/Historic Route 66 between Doheny Drive and La Cienega Boulevard. WeHo Carnaval takes place on All Hallow’s Eve from 6 to 11pm. No tickets are necessary, but costumes are encouraged. Stay at Le Parc Suite during the festivities, the perfect home base for all your ghostly needs. Click here for reservations and Happy Halloween! If you only have time for one museum, head to LACMA for a day of contemporary art bliss. With over 128,000 pieces of art, it’s the largest of its kind in the western United States. After exploring the exhibitions, swing by the museum's hip coffee shop, C+M, for a boozy milkshake or eclectic vintage-inspired deserts. Visit for a digestible collection of edgy contemporary art. The permanent collection and rotating exhibitions are artist-centric and progressive. Currently on view in the lobby is Japanese artist Tabaimo site-specific work and her first solo exhibition in Los Angeles. Los Angeles is a year-round destination, but things are just a little more steamy during summertime. Enjoy the last days of the summer season while indulging in these perfect tourist activities. Let the California sun be your guide as you saunter through the immortalized gold lettering in the pink terrazzo. Feel the Hollywood magic and stardust as you search for your favorite celebs amongst the 2,600 shining stars. Nothing makes you feel more Hollywood than walking along the European cobbled walkways of Two Rodeo. Pop into the high-end boutiques or let your imagination run wild window-shopping. Spend a couple of hours browsing the connection between humans and space at the popular “Hall of the Sky” and “Hall of the Eye.” Reenact your favorite La La Land moments and then relax in Griffith Park for picturesque views of the city. The building itself is a true work of art. Fourth of July isn’t the only reason to celebrate this month. We have our radar set to cool, and these events are sure to set the mood. Cocktails, live music, botanical tours, and creative projects make this a perfect Friday night. Enjoy a refreshing breeze under the stars at the Natural History Museum. Dance away to The Wallflowers, B-52’s, and Toad the Wet Sprocket to name a few at this weekly Saturday concert series starting on July 15th. Nothing says summer like a vibrant outdoor concert. Celebrate the music of Stephen Sondheim in this one-night-only evening dedicated to his vast musical career. Gustavo Dudamel will lead the Los Angeles Philharmonic and Vanessa Williams, Jesse Ferguson (Modern Family), Matthew Morrison (Glee), and more. West Hollywood is gearing up for one of the largest LGBT pride events in the United States. Come out for the two-day festival that culminates with the #ResistMarch for human rights. The celebration is sure to be one of the most colorful and meaningful yet. Brandy and Chromeo are headlining, which guarantees an incredible dance party. Buy tickets here. Check out the best up-and-coming filmmakers from around the world at the annual LA Film Festival, hosted by the nonprofit Film Independent. Ideal for film aficionados and those looking to break into Hollywood. For a full lineup of events and screenings, click here. Calling all La La Land fans. Soon you will be able to experience the Academy Award-winning original score live at the iconic Hollywood Bowl. The world tour kicks off in L.A., May 26th and 27th, with Justin Hurwitz conducting his score performed by a talented 100-piece symphony orchestra, choir, jazz ensemble, and the original vocal recordings. Hurwitz is thrilled to share his vision with the audience and have them experience the music in person, performed by master local musicians playing in real time. The concert will also tour Canada, Mexico, the U.K., Italy, Turkey, and Switzerland. But we can’t imagine anything more magical than enjoying it in Los Angeles, it’s namesake and inspiration. Lionsgate is suggesting attendees dress in the vintage style of the movie incorporating old Hollywood garb. Elevate your spring and treat yourself to a star-studded night at this historic amphitheater. Nobody gets us moving like this indie rock Canadian band that will have your entire body bumping. Whiteout Conditions, their seventh and newest album, has been heavily anticipated and for good reason. They are ridiculously talented and an excellent live show. This world-famous artist needs no introduction. Catch one of his live shows at the iconic Forum and let the RnB vibes take over--who knows maybe you won’t be able to feel your face. Indulge in tastings from over two dozen top restaurants, while sipping on wine flights from Silver Lakes Wines and listening to music from KCRW DJs. Some of the featured participants are Momed, Malo, and Little Dom’s, all hotspots destinations. A great way to spend a Sunday afternoon. This year St. Patrick’s day falls on a Friday night, giving us plenty of opportunities to celebrate. However, if you are over the age of 25 and still drinking green beer and leprechaun inspired cocktails, we have a better alternative for you. Why not tip your hat to the culture by exploring Irish Whiskey’s right here at our hotel bar? Visit the Knoll restaurant and have it either mixed or sip it neat. Whatever your preference, it’s a great way to connect with the holiday. When enjoying your drink, here are a couple of tips to keep in mind. The flavor of Irish Whiskey will be lighter than it’s counterpart Scotch. It will also be less smoky because they tend to have fuller flavors due to the mix of grains, unmalted, and malted barley. Jameson is the most famous and Bushmills is considered to be the oldest, however, the industry is experiencing a boom and new smaller companies are producing smaller batch whiskeys. When in doubt ask your bartender, they should be able to lead you in the right direction. Pick a poison and sip it slowly. Happy St. Patricks Day to you! February is for lovers and we at Le Parc Suite Hotel want you to enjoy your holiday in the throes of luxury and relaxation. Rekindle your romance with a couple of bonding activities. Take an early morning stroll hand-in-hand through our charming and fashionable neighborhood. Nothing is more amorous than window-shopping before the rest of the world has risen. Pick up a green juice or coffee nearby to give you an energizing boost. Indulge in a spa treatment for two. We suggest Voda Spa for a traditional environment or Ole Henriksen Face & Body Spa for a celebrity-style treatment. Relax on our rooftop deck poolside or melt into relationship heaven in our hot tub. Our prestigious hotel amenities are the most coveted in the neighborhood, so soak in all the opulence. Spend a romantic evening having dinner at our onsite star-rated restaurant, The Knoll. The intimate bistro-style setting is the prime spot to get cozy and enjoy each other’s company. For more information visit us online or call 877-591-9556 for reservations. Check out these fantastic comedic events happening this January. The holidays have finally passed and now we can return to our regular programming. However, no weekend in Los Angeles is ever ordinary. Check out these fantastic comedic events happening in January. On the 8th, is the “No Pants Subway Ride,” this may not be an official comedic event but it is sure to stir some smiles and laughs. Join in the fun or try to catch a glimpse of a some New Year’s resolution legs. For a traditional evening of comedy, head to Downtown Independent on January 11th, where Time Out Los Angeles is hosting a night with some of the hottest up-and-coming comedians. The show includes Matt Ingebretson, Zach Sherwin, Dulce Sloan, Frankie Quinones, Amanda Seales, Dave Ross, American Town Hall and more. The following week catch Riot LA, an alternative comedy fest running from January 19-22nd. The lineup includes Ali Wong, Felipe Esparza, Mel Brooks, and Rachel Bloom. These events are guaranteed to start off your year right!